# Blind bake 1 sheet of pastry in a pie dish. 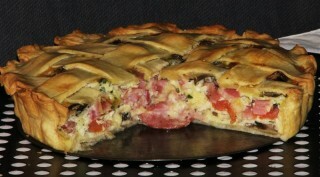 # Arrange layers bacon, tomatoes, parsley and mushrooms. # Beat eggs, add cream, salt and pepper to taste and pour this mixture over pie mixture. # Cut the 2nd pastry sheet into lattice strips and arrange over pie, trim and crimp edges. # Bake at 180C for 25 to 30 minutes, until golden brown.